Lois Olson and Theresa Rayford, representing the Royal Gorge Artists Association, presented Cañon City Schools with a check to support K-8 arts instruction. ​I would like to thank the Royal Gorge Artist's Association for donating funds to the art departments in each of our schools that serve students in grades K-8. 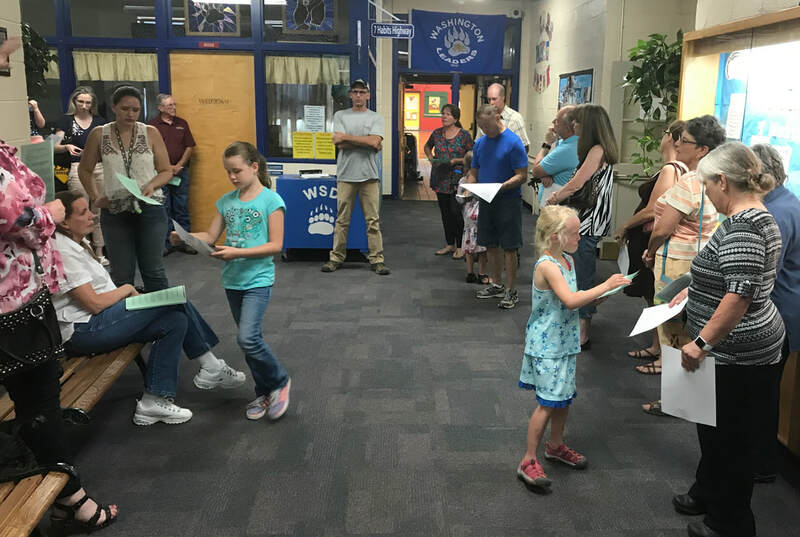 Schools receiving $500 donations include McKinley, Washington, Cañon City Middle School, Cañon Exploratory School, Lincoln School of Science and Technology, Harrison K-5, Harrison 6-8, and Mountain View Core Knowledge School. The Royal Gorge Artist's Association is a non-profit organized over 60 years ago. Their goal is to promote, encourage and support arts at all age levels. RGAA feels strongly that art education is an important part of a student’s well-rounded education. These donations will be used to purchase art supplies to enrich programs for the students. Lois Olson and Theresa Rayford were on hand at our September 11th Board of Education meeting to present these funds. I want to thank Director of Operations Jeff Peterson for his tireless work conducting community tours of our buildings allowing citizens to see the challenges we face maintaining safe facilities. His passion for our students, his work ethic, and his willingness to speak honestly about our challenges has been greatly received by all attendees. Director of Operations Jeff Peterson prepares to take community members on a tour of Washington Elementary. Last week we conducted a community tour of Washington Elementary School to answer questions about our facilities concerns there. This, and earlier tours of Cañon City Middle School, is related to the two questions Cañon City Schools has on this year’s ballot. The override question states funds must be spent to upgrade outdated instructional materials, improve student access to technology, improve the level of maintenance on buildings, attract and retain high-quality staff members, and enhance educational opportunities for preschool students. What is our plan to do this? Priority one will be to purchase and place an electronic device in the hands of every student over the course of four years (by fall 2021), beginning with all high school students in fall 2018. -The district will support the use of these devices and upgrade them on a three to four-year cycle for a period of 10 years. -Achieving this will make it easier for the district to replace outdated instructional materials because digital curriculum materials cost less to purchase, are more engaging for students to use, and are easier to update. -Remaining dollars will be allocated to address annual health/safety/maintenance needs to get the most out of facilities investments. -A good portion of these funds will be used to align employee compensation packages with those of other districts in the region to attract and retain the best educators and support staff available. -A final area of focus will be to support the work ECHO Council does educating Cañon City’s preschool children. The bond is asking for an $18.2 million contribution to allow the district to execute $52.9 million worth of capital improvements. This is a nearly 70% discount on completed work. What are these projects? 1. A new Cañon City Middle School will be built on the current property and all sections of the old facility, except for the 1980s gym will be demolished. 2. A new Washington Elementary School will be built on the current property and all sections of the old facility will be demolished. 3. Mountain View Core Knowledge Charter School’s building lease will be paid in full making it possible for the charter school to shift annual lease expenditures of approximately $130,000 to instructional purposes. If the bond question passes all outstanding roof upgrades will be conducted. -Abate asbestos insulation and replace all remaining outside single pane windows with energy efficient products at CCHS, Lincoln, and McKinley. -Replace 28 leaky and cracked skylights on the high school gym. -Replace 135,000 square feet of significantly aged and leaky roofing at CCHS, CES, and McKinley. -Replace all galvanized water distribution pipe and valves with modern polyethylene pipe in CCHS, Lincoln, and McKinley. -Install a keyless automatic entry system and ADA button, along with access surveillance cameras at the building main entries at CCHS, CES, Harrison, Lincoln, and McKinley. -Extend the rear CCHS entry canopy to enclose the access area between the art room and rear hallway to increase safety. -Upgrade fire alarm systems to include a Blue Button panic alarm in CCHS, CES, Harrison, Lincoln, and McKinley. -Replace 2,750 square feet of dangerous, non-safety glass interior windows in older hallway sections T CCHS with painted and framed drywall. -Replace gymnasium and 1980s wing HVAC rooftop units at CCHS. -Install new classroom intercom/emergency communications systems at CES, Lincoln, and McKinley. -Abate and remove the asbestos laden modular building located on the playground at CES. -Replace all old wood and metal core and wood framed outer entry doors at Lincoln and McKinley. Last week I attended a Literacy Coach meeting, a McKinley academic improvement planning meeting, a board work session and regular meeting, and a Building Bridges for Quality Cañon City Schools meeting. I also held Superintendent’s Advisory Council, Leadership, and Classified Association leader’s meetings. I also attended a Communities that Care key leader quarterly meeting, engaged in some grant writing, and participated in a Washington Elementary facilities condition tour. At last year's CASB Fall Regional meeting board secretary Mary-Kay Evans was honored with a McGuffy Award for outstanding service as a board director. On Monday evening, I’ll travel to Pueblo with board members to attend the Colorado Association of School Boards annual regional gathering. Tuesday will start with a Chamber of Commerce meeting, then proceed with Superintendents Advisory Council, a Gateway to College meeting about graduation requirements, and a Facilities Corp meeting. I also hope to attend the Cañon City Middle School PTO meeting, a Fremont County Economic Development Council meeting, a Southern Superintendents Association meeting, and the Pikes Peak Teaching and Learning Center launch event this week. I’ll end my week at the State Superintendent Conference in Vail on Thursday and Friday.